“Despite his obvious gifts as a composer, Egon Joseph Wellesz (1885-1974) can hardly be regarded as a household name today. His six operas are rarely performed, barely even mentioned in the standard histories of twentieth-century music. While Wellesz's instrumental works have fared slightly better than his vocal compositions, relatively few of them appear in the standard repertoire. 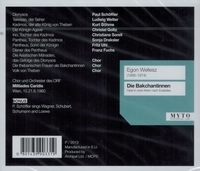 In most surveys of modern music, Wellesz, if he is mentioned at all, is usually cited as a musicologist whose works on Byzantine and Arabic music still remain influential, as a student of Arnold Schönberg and Guido Adler, as a colleague of Anton Webern, or as a teacher of the composer Peter Sculthorpe. What the textbooks fail to disclose is that Wellesz himself was a remarkably accomplished composer whose works spanned a vast number of genres and styles. Even aside from music, Wellesz's interests were eclectic. His early comic opera SCHERZ, LIST, UND RACHE (Jest, Cunning, and Revenge, 1927) was based on a Singspiel of the same name by Goethe. 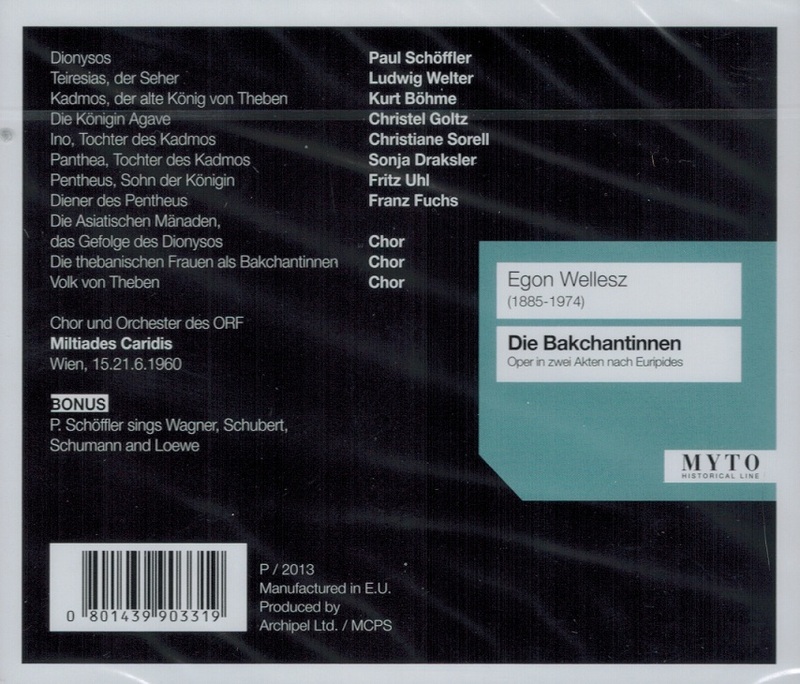 Two early operas, ALKESTIS (1924) and DIE BAKCHANTINNEN (1931), took their inspiration from Euripidean tragedies. DIE OPFERUNG DES GEFANGEN (The Sacrifice of the Prisoner, 1926) was suggested by an Indian text found in southern Mexico. The three-movement symphonic poem PROSPEROS BESCHWÖRUNGEN (Prospero's Entreaties, 1934-36) was based on Shakespeare's THE TEMPEST. The composer's late comic opera INCOGNITA (1950) resulted from Wellesz's collaboration with the poet Elizabeth Mackenzie and took its story from a comedy of manners by the eighteenth-century English playwright William Congreve. For DIE BAKCHANTINNEN, Wellesz shaped his own libretto but remained extraordinarily faithful to the plot of Euripides' last tragedy, THE BACCHAE (406 B.C.). He made one slight change to the background story that occurs before the action of drama begins." “Wellesz studied in Vienna under Arnold Schönberg — purportedly his first private pupil — as well as Guido Adler, who founded the musicological institute in Vienna and was a leading editor of the Austrian Denkmaler. These dual influences shaped much of his musical and scholarly thought. In 1913, Wellesz embarked upon what would become a lifelong interest in the musical achievements of Byzantium. “Soprano Christel Goltz was a discovery of conductor Karl Böhm and one of the leading dramatic sopranos of her generation who possessed a rich voice with a brilliant range and intensity. She was particularly associated with the operas of Richard Strauss, especially SALOME and ELEKTRA, and with contemporary operas. Before she became a singer, Goltz had been a dancer and was physically the antithesis of the typical operatic soprano: small, lithe, and energetic. Despite her diminutive stature, Goltz had a big voice that easily made it out to the farthest tier, and it is said that when the character Narraboth killed himself in Strauss' SALOME, that Goltz would leap over his dead body during the Dance of the Seven Veils. It was in dramatic rôles such as Salome and Elektra that Goltz made her mark, and by all accounts in performance she was extremely effective at them. 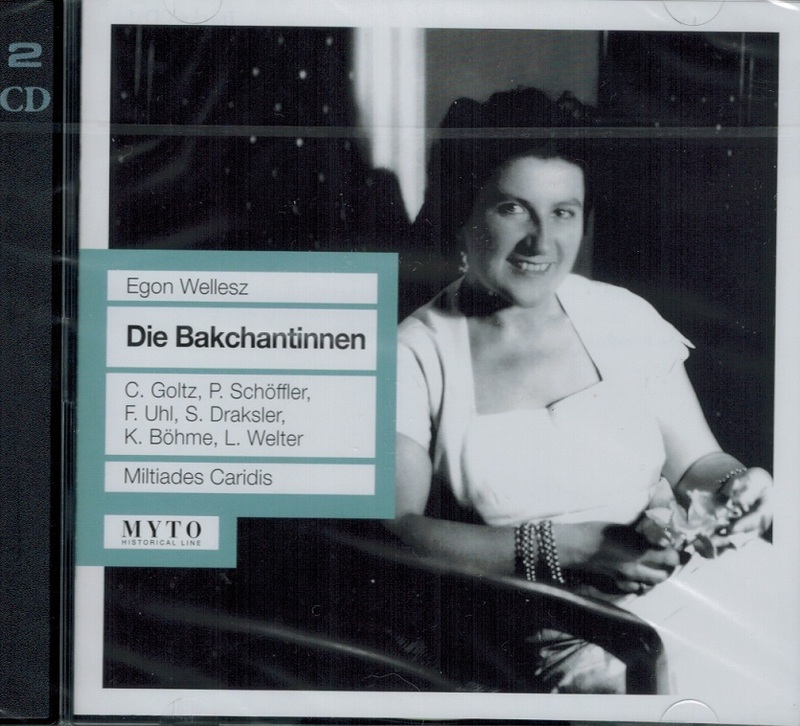 The only sizable studio recordings she made -- SALOME with Clemens Krauss and ELEKTRA with Georg Solti -- were in such rôles. Early in her career, Goltz also created rôles in works of Carl Orff and Swiss composer Heinrich Sutermeister. Born in Dortmund, she studied in Munich with Ornelli-Leeb and with Theodor Schenk, whom she later married. After singing small rôles, she made her official début in Fuerth, as Agathe, in 1935. She sang one season in Plauen, before joining the roster of principal sopranos at the Staatsoper Dresden through the invitation of Karl Böhm in 1936. She remained at that house until 1950. She began appearing at both the Berlin State Opera and the Stadtische Oper Berlin in 1947, and at the Munich State Opera and Vienna State Opera in 1950. Beginning in 1951, she also made guest appearances in Salzburg, Milan, Rome, Brussels, Paris, London, Buenos Aires, and sang at the Metropolitan Opera in 1954. Besides SALOME and ELEKTRA, her greatest successes included the title rôle in JENUFA, Marie in WOZZECK, Die Farberin in DIE FRAU OHNE SCHATTEN, Leonora in FIDELIO and Elettra in IDOMENEO. She created the title rôles in Carl Orff's ANTIGONE and Rolf Liebermann's PENELOPE. An intense singing-actress with a clear and powerful voice of great range, she also tackled a few Italian rôles, notably Turandot. “Despite having been born in Germany, bass-baritone Paul Schöffler became a favorite in Austria, both at the Vienna Staatsoper and at the Salzburg Festival. Aside from Friedrich Schorr, he was undoubtedly the finest, most complex interpreter of Hans Sachs in the recorded era. Although his voice could sound slightly dry and lacked the imperious sound for Wotan (which he did sing on occasion), it served him well through an unusually long career. His Sachs at the Metropolitan Opera in November 1964 was superbly sung, remarkable in its stamina, even though Schöffler was 67 at the time. A live recording of Strauss' DAPHNE made in Vienna that same year confirms the impression. The work of an aristocratic artist, Schöffler's interpretations of such roles as Scarpia, Don Giovanni, and Iago were always distinguished, even when not stylistically definitive. The years since his retirement from leading roles have not produced a remotely comparable artist. Schöffler studied with Waldemar Stägemann in his native Dresden before traveling to Italy to work with baritone Mario Sammarco. His 1926 stage début took place in Dresden in the role of the Herald in LOHENGRIN, beginning an association with that theater that continued until 1939. In 1939, Schöffler was engaged by the Vienna Staatsoper and remained there until 1970 when he was 73 years old. During his long career, he also sang in London, at Bayreuth, at the Salzburg Festival (1938 - 1965), in several Italian theaters and in America at the Metropolitan Opera, in San Francisco, and in Chicago. Schöffler's London début came as Donner in a 1934 RHEINGOLD, conducted by Beecham. He was well-received by both the public and the critics, later confirming the positive first impression with his ‘excellent’ singing of the title role in Weinberger's SCHWANDA, THE BAGPIPER. In 1936, he sang Scarpia and, with the visiting Dresden Opera, Figaro in Mozart's LE NOZZE DI FIGARO (sung in German as’Die Hochzeit’) and the title role in one performance of DON GIOVANNI. In the Mozart operas, he was praised for both fine singing and histrionic aptitude. He undertook such other roles in London as Jochanaan, Kurwenal, the RHEINGOLD Wotan (described as ‘lightweight’), and, following WWII, Don Giovanni ‘Germanic’), Don Alfonso, and Pizarro with the visiting Vienna Staatsoper company. With the Royal Opera House company, he repeated his Kurwenal and RHEINGOLD Wotan and added Gunther and his genial Sachs. At Salzburg, Schöffler created the title role in Gottfried von Einem's DANTONS TOD in 1947, and, five years later, he premiered Jupiter in Strauss' DIE LIEBE DER DANAE. Schöffler's first American stage appearances came well after WWII, when the singer was already in his early fifties. His Met début was on 26 January, 1950, as Jochanaan, a role he sang to the spectacular Salome of Ljuba Welitsch a few weeks later. Schöffler's performance was praised as that of a superior artist, delineating the character with intelligence and involvement. The bass-baritone faced off against Welitsch in two other productions, setting his Don Giovanni at odds with her Donna Anna and, as a ‘brutish’ Scarpia, menacing her fiery Tosca. Over nine seasons, Schöffler sang a total of 91 performances. His 14 roles included Pizarro, Amfortas, Kurwenal, Oreste, and the Grand Inquisitor. San Francisco heard him, too briefly, in Wagner and Strauss, as did Chicago.